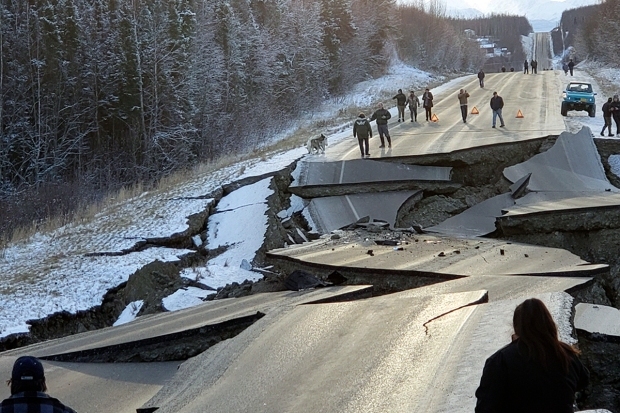 The supply chain of food and other goods delivered to the Port of Anchorage from the Lower 48 has not been disrupted by the powerful earthquake that caused widespread damage to roads in the Anchorage area. "The ships are coming in on schedule, the supply lines are at this point uninterrupted," Anchorage Mayor Ethan Berkowitz said Sunday at a news conference. The magnitude 7.0 earthquake rattled the state's largest city early Friday morning swaying buildings and fraying nerves. There were no reports of deaths, serious injuries or structural damage to buildings. Roads, however, took the brunt of the damage, especially the scenic Glenn Highway, the closest thing Alaska has to an interstate and links the state's largest city to suburban communities to the north. Traffic has been snarled since the quake. Delays came as drivers were diverted around road damage on temporary detours or the highway was reduced to one lane while crews try to reconstruct the roadway after the temblor caused sinkholes and buckled pavement. Employees who live north of Anchorage are being encouraged to take Monday off or work from home if possible to reduce traffic. Gov. Bill Walker, who leaves office at noon Monday, gave state workers in the Anchorage area the day off to help reduce the number of cars on the highway. Schools have been closed until Dec. 10, which should also reduce traffic. Walker said he would not be traveling to the rural village of Noorvik for the swearing in of Gov.-elect Mike Dunleavy on Monday but instead would remain in Anchorage to keep working on recovery efforts. Roads aren't the only transportation worry in Alaska. About 90 percent of all the goods sold in Alaska are delivered to the Port of Anchorage, where officials have completed a preliminary damage assessment. "Everything looked good," Municipal Manager Bill Falsey said. "There was some structural concerns with some of the trestles. We have got some things on a watch list but nothing that should impede operations." Two major cargo companies operate at the port. One was offloading barges as normal on Sunday, and the other company is scheduled to offload barges Monday after successfully testing their crane system. Jet fuel was also being unloaded at another terminal Sunday. "We're estimating we have on hand now automotive gasoline supplies that will be good for at least three weeks, and that the next shipment comes in on Dec. 7," he said. "We're not expecting any disruptions to those supply chains." Officials on Saturday encouraged Alaskans not to make a run on grocery stores, saying there was no reason to hoard food. However, at least one grocery store Sunday morning had no milk and little to no bread, bottled water or bananas. Berkowitz said the stories he's heard, particularly from grocery stores, in the immediate aftermath of the earthquake was of cooperation and sharing. "Even when people were initially concerned, people who might have been reaching for the last item, looked over and saw someone else and said, 'Yes, we are sharing this with you,'" he said. He also touted Alaskans' longstanding tradition to stock up for long winters. "I would encourage people, once the ships get in, once things settle back down, make sure you have the emergency preparations, the emergency kits that you should have," he said. Schools will be closed for the week so damage assessments can be conducted on about 4,000 classrooms in 86 schools and four other facilities, comprising 8 million square feet, to make sure they are safe for staff and students, Superintendent Dr. Deena Bishop said Sunday.